Detail from 'Frankenstein observing the first stirrings of his creature'. Engraving by W. Chevalier after Th. von Holst, 1831. 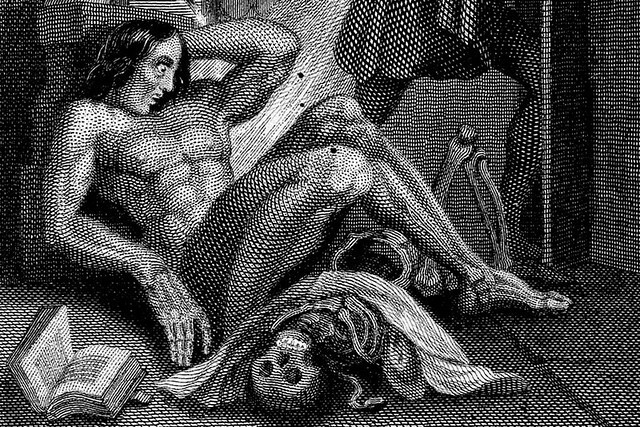 The story of how Mary Shelley’s Frankenstein came to be written is well known. It was 1816; Mary and her lover Percy Bysshe Shelley had followed Lord Byron to spend the summer months in Switzerland. During the long, often wet and stormy evenings, so the story goes, they recited poetry and read to each other spine-tingling tales. Eventually bored of the stories, Byron proposed that they should each write a supernatural story of their own. The Frankenstein idea came to Mary in a waking dream. She imagined a student, who had pursued forbidden science to discover the ‘cause of generation and life’, finally bestowing animation upon lifeless matter. Mary developed the idea, nurturing it over nine months, and finishing it in the spring of 1817. Frankenstein was published the following year. A preface to the first edition of the novel, purportedly by the author but actually penned by Percy, declared: ‘The event on which this fiction is founded, has been supposed by Dr Darwin… as not of impossible occurrence.’ Dr Darwin was Erasmus Darwin, Charles’s grandfather, and the ‘event’ was a series of strange experiments he described in 1802, in which he had apparently caused inanimate matter to move of its own accord. Had discussion of Darwin’s experiments given her a glimmer of hope that science could one day discover how to reanimate a dead human? And what was the vital need, the vital spark that separated the animate from the dead? Mary was acutely aware of many of the cutting-edge scientific debates and discoveries of her time. The second half of the 18th century was alive with scientific debate and discovery. Notions of ‘vitalism’ became newly controversial and, in the 1790s, respected scientists publicly challenged each other on the subject of the nature of life, of what lay at the heart of the vitality of all animals. But Mary may also have been exploring another principle of life that the pioneering male scientists of the age had overlooked. Her sensitivities to nuances of character and the valencies of human interaction brought to vivid life the real significance of the thrilling and terrifying knowledge she absorbed, and her novel became a profound reflection on the complexities of human nature. Reflecting, in part, her own world, her characters combine features of the real people she met, knew and loved. The production is a co-production with San Francisco Ballet and is generously supported by the Monument Trust, The Taylor Family Foundation, Sarah and Lloyd Dorfman, Simon and Virginia Robertson, Will and Beth Gardiner, Karl and Holly Peterson, The Shauna Gosling Trust, The Constance Travis Charitable Trust, The American Friends of Covent Garden, the Frankenstein Production Syndicate, Bently Foundation, The Hellman Family and E. L. Wiegand Foundation.